I only met the radio DJ and sometime music show host Andy Kershaw once and that was about ten years ago. He had something to promote and his old co-presenter Mark Ellen, who was now editing a monthly music magazine called The Word, asked me if I wanted to do a Q&A interview at his house. I didn’t need much persuading because, actually, there had been something I’d been meaning to ask Kershaw for the previous 20 years. Back at the beginning of 1986, I was an awkward adolescent trying to find my feet at a further education college in Birmingham, after spectacularly failing almost all my O-levels the previous summer. I didn’t know too many people and in my adolescence, I had reached a peak of social ineptitude. I was trying to turn into something cooler and more enjoyable than what I was at that point, but I didn’t quite know what that was going to be. I loved music — both pop and what little ‘alternative’ music I had heard. I wanted to make some new cool friends, but I didn’t know how to go about doing that. At college, I started to nervously make some inroads. There was a girl in my Sociology class called Angela, who wore oversized t-shirts and wore her hair floppy on top and shaved at the sides. She had the names of loads of bands — The Wedding Present, Primal Scream, The Soup Dragons — written on her folder. I hadn’t heard any of them, but I knew I needed to remedy that as a matter of urgency. One day, I summoned the courage to start a conversation with her. “Where can I hear some of these bands?” I asked her. She suggested I could start by listening to Andy Kershaw’s weekly Thursday show, the next one of which happened to be between 10pm and midnight on that very evening. I went home and did exactly as she said, and what happened set off a chain of events that changed my life. Back in the early months of 1986, Andy Kershaw used to play a range of music that ran the gamut between the emerging vanguard of indie bands making waves both here and in America, Australia and New Zealand, a smattering of Zimbabwean pop and classics from the alternative canon of the previous decade or two. In the space of two hours I heard records by The Go-Betweens, Jonathan Richman, Iggy Pop, Shop Assistants, The Chills, The Mahotella Queens, Sonic Youth, The Wedding Present, The Byrds and The TV Personalities. Not only did I become obsessed with all of these records, but I found routes from these artists to other artists, with whom they were in some way connected. Every record was a seed that germinated in my changing worldview and led me to more music. The cassette of that show went into the new red Aiwa personal stereo whose batteries I would dutifully recharge every evening before going to sleep. I’d listen to side one on the way to college and side two on the way back. Soon, I became something of an expert on this stuff — at least, I thought I was enough of an expert about it to hold down a conversation with Angela and a couple of the other indie kids with whom I was starting to become friendly at college. Someone mentioned writing a fanzine. I’d heard about fanzines because my brother was a studying fine art at Manchester Polytechnic and sometimes, when he came back to visit, he’d bring one or two of them back with him. I thought that one way to impress Angela would be to start my own fanzine, and we could interview some of these bands when they came to Birmingham. Within a few months, I had met The Go-Betweens, Primal Scream and even Julian Cope. That Andy Kershaw show set off a chain reaction which opened up a whole new world of music to me, and in doing so set me on a path which determined the course of my adult life. But much as I loved the new musical worlds opening up before me, I never stopped loving pop. I never stopped watching Top Of The Pops or going to Woolworths the day after another bunch of records dropped out of the Top 75 and into the half-price bin. I never thought indie or world music or reggae or psych-pop or any of that stuff was superior to, say, Rock Me Amadeus or Papa Don’t Preach or A Different Corner. I might have started buying Melody Maker, but I never stopped reading Smash Hits. For me, it was all part of the same thing. So, yes, 1986 was a very good year — and one day, I hoped to tell Andy Kershaw about the part he had to play in all of that . By the time I got a chance to do that in 2006, I also wanted to meet him because my Aiwa machine had long since chewed up that tape. I was hoping that he might perhaps keep a record of all his old shows and what he played on them, so I might be able to locate a recording of the show or get a list of what he played, all the better to recreate it. I really looked forward to telling him about it because I thought that perhaps the best thing about having a radio show would be to meet someone whose life you had helped to change, simply by virtue of your music selections. I figured that if someone said that to me, it would make my day, my week even. Perhaps by telling him that and thanking him, I might make his day too — and, like I said, he might even be able to help be replace my tape. With all that in mind, I turned up to his house and told him all about what had happened on that evening in 1986, and about the chain of events that followed. He paused for a second before shrugging and, in a tone that verged on boredom, muttered something about not having kept his old shows before suggesting we start the interview. 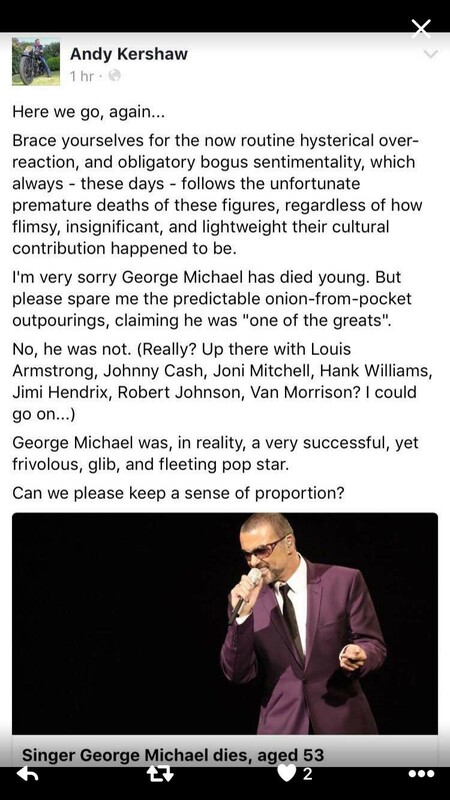 So when I heard about his ignorant, petty, mean, ungracious, unnecessary, disrespectful dismissal of George Michael and people’s reactions to his death yesterday, I wasn’t quite as surprised as I might otherwise have been. And yet, for all of that, it remains that Andy Kershaw taught me two important things, and for those, I will always remain grateful: (1) If you hear the right music at the right time, it can change your life; (2) Learn from what Andy Kershaw allowed to happen to him and never ever, ever allow that happen to you.